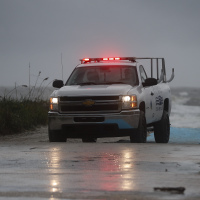 A hurricane pelting the coast of Florida and described as a 'monster' by a local official has brought chaos to the state, with flights cancelled, homes evacuated and theme parks shut. Florida governor Rick Scott said he would 'pray for everybody's safety' as Hurricane Matthew - the most powerful storm to hit America's Eastern seaboard in over 10 years - swept in. Across the state some 200,000 homes are without power, with evacuation zones up and down the coast. Parts of Florida state have been deluged by heavy rain as the storm - sitting around 100 miles off the coast as of Friday morning - threatens 130mph winds. It's graded a category 3 storm, which means winds of between 111-129mph and the risk 'well-built homes' could 'suffer major damage'. Airports at both Fort Lauderdale and Orlando have closed - with more than 3,000 flights cancelled on Thursday and Friday - reinforcing the importance of arranging travel insurance before you head off on holiday. Some 4.4 million people live in Miami and Fort Lauderdale, but as the storm passed the area overnight it failed to make the land and remained at sea. Further up the coast, bridges were closed and trees ripped from their roots across Indian River County. As far away as Orlando - some 200-odd miles from Fort Lauderdale - hotel guests were being urged to stay inside. Disney World, Universal Studios and SeaWorld have all been temporarily closed. Forecasters believe Matthew could hit dry land north of Palm Beach County, before heading up the coast toward Jacksonville.